They say no man is an island, and no superfan of a TV show wants to watch her beloved program in isolation, either. Humans need community, if only to discuss the latest stats in the reality TV Drink Toss Olympics and whether the house villain is “here for the right reasons” or not. This is why it’s crucial to recruit your best pals into becoming believers in your favorite show. Lifetime’s UnREAL is perfect because it’s got something for everyone, from your TV-hating friend to the one who’s seen every reality show, ever. But this should be done with a careful touch — no one wants to feel like he or she is being brainwashed into joining a show’s fan base. 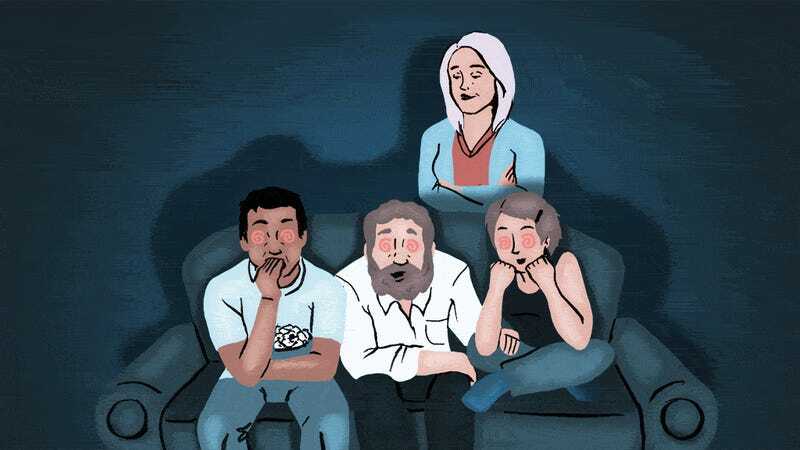 Use these sly tricks to give your friends a gentle push toward your favorite TV series, and they’ll be gladly joining you on the couch for every episode. No one can resist the siren call of free wine, cheese, and assorted crunchy snacks, so pull out all the stops on season premiere night and set up a nice spread for your squad. Switch on the premiere episode (a perfect way to get pals locked in for the season), start sipping that vino, and watch the returns roll in. Sure, luring friends into addiction might sound like a negative thing, but when it’s addiction to a top-notch TV show and it gives you people to discuss the upcoming season of your favorite show like UnREAL, it’s a very positive thing. If you’re feeling ambitious and extremely social, have a weekly standing watch date — it’s a great way to catch your favorite show and stay in touch with your besties. Most good television appeals to a variety of people. Capitalize on that. For example, do you have a friend who brags about how she doesn’t own a TV (we get it, you’re better than everyone *eyeroll*) and absolutely hates reality shows? Or maybe you have another friend who schedules her nights around her favorite reality TV program, who lives by TV catchphrases, and regularly drinks the reality TV Kool-Aid? They both feel strongly about television, and that’s a start. Exploit these differing emotions to serve your ultimate goal — to gather a posse of pals and subtly convert them into becoming super fans of your most beloved series. I must point out that these imagined (and very different) friends would both love UnREAL, but for opposite reasons — it’s a show that pulls back the curtain on the manipulation inherent in reality TV (friend A) while portraying the thrilling dirty details of that genre (friend B) — the best of both worlds! This trick is often used on children, but most of my friends would fall for it (sorry, guys). Step one: Ask your pals to do you a favor and help you move furniture in your home or paint a room. Step two: Nearby, have your favorite show playing on a television, seemingly for no one. Step three: Secretly cheer as your besties attempt to shirk their duties and do anything more interesting than the favor you’ve requested. This is the Upside Down Pineapple Cake of ways to get your friends obsessed with your favorite show — it’s a little backwards, but when it works, it’s beautiful. Carefully (but casually) dropping references to a beloved TV show in conversation is a strategy that some might call “shameless emotional manipulation,” while others might say it’s “brilliant Machiavellian maneuvering.” Whatever. Listen, everything can be connected back to pop culture — it’s the shared language of the modern age. It’s practically Shakespeare. So, as your BFF gripes about her unethical but inspiring boss, compare it to the dynamic between Rachel and Quinn on UnREAL. Or if your friend is torn between two hotties, you might mention Rachel’s push-pull dynamics with Adam and Jeremy on the show. Or maybe your pal is secretly tinkering with another friend’s bipolar medication. Drop a shout out to shameless producer Shia (but then intervene because that situation is completely inappropriate and illegal). If all of that feels a bit too “Rachel Goldberg-y” (read: manipulative but possessing understandable reasoning), push those feelings down. All’s fair in love and television. For the softest sell of all time, have friends over and play songs from the TV show. When your friends ask what they’re listening to (and they will, because everyone’s paranoid that some pop star dropped yet another complete album overnight and you somehow missed it and are thus culturally irrelevant), explain that it’s a collection of music from your favorite TV show and, hey, how about we put on an episode right now so you can hear the music in context? Now that sell is so soft, I’m not even sure if it was a sale (oh, it was). Do you have a friend who thinks that reality TV dating shows are horrifying meat markets that promote antiquated, heteronormative ideals in which a helpless woman whose only currency is her looks/sexuality must be rescued by a man, should he care to choose her? Totally! So, rather than giving a ratings boost to that actual thing, how about you flip the script and watch a show that expertly skewers and subverts that very thing — UnREAL on Lifetime? Watching television has never seemed so smart! If you’re seeking a show to entertain you through the summer, then you’re in luck: UnREAL is coming back to Lifetime for season 2 on June 6 at 10/9c. This show has something for all of your friends — reality TV haters, reality TV lovers, and pals who just want to score some free wine at your watch party. It won’t be hard to get your besties obsessed with your favorite show and before you know it, you’ll all be group-writing UnREAL fan fiction (Quinn + Jeremy — could you imagine?). See you in the Enchanted mansion!